A higher proportion of persons living at latitudes of 35° North or greater have celiac disease or avoid gluten than persons living south of this latitude, researchers report in the June issue of Gastroenterology. This difference was independent of race or ethnicity, socioeconomic status, or body mass index. 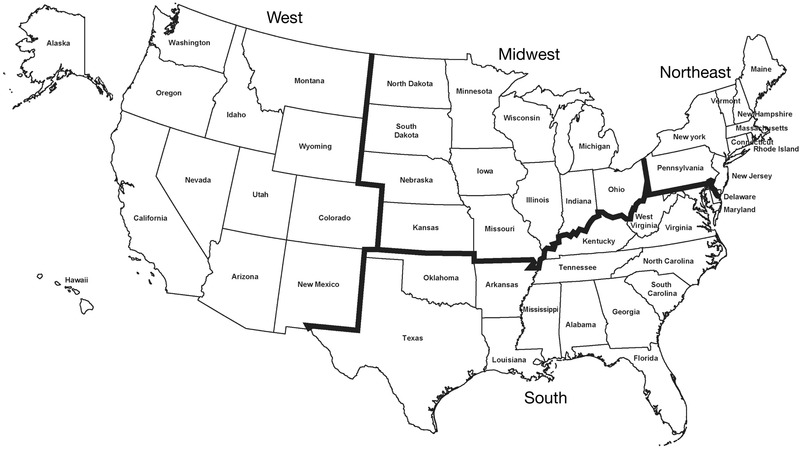 Latitudes of the United States. Several autoimmune diseases have North−South gradients in incidence despite genetically similar populations (inflammatory bowel disease, multiple sclerosis, and rheumatoid arthritis). Aynur Unalp-Arida et al investigated whether there is a similar geographic variation in celiac disease incidence. They analyzed data on gluten-related conditions from the National Health and Nutrition Examination Survey (NHANES), from 2009 through 2014, on 22,277 participants 6 years and older with celiac disease, based on results of serum tests for IgA against tissue transglutaminase and endomysium or on the combination of health care provider diagnosis and adherence to a gluten-free diet. Gluten avoidance without celiac disease was defined as adherence to a gluten-free diet without a diagnosis of celiac disease. 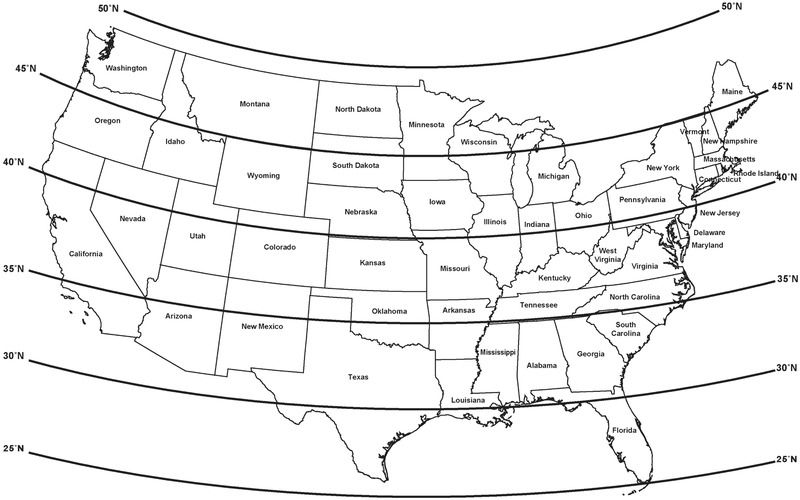 The United States comprises latitudes of approximately 25° to 50° North (see figure). Unalp-Arida et al found 27% of persons with celiac disease to live below 35° North, 31% to live from 35° to below 40° North, and 42% to live at 40° North or higher. Celiac disease was present in 0.7% of the sampled US population. Prevalence increased from 0.2% to 0.6% to 1.2% as latitude increased from below 35° North to 35° to 40° North to 40° or more North. After adjustment for demographic factors and body mass index, celiac disease still associated with higher latitude. Compared with below 35° North, the odds of celiac disease were more than 3-fold higher at 35° to 40° North and more than 5 times higher at latitudes above 40° North. When the authors substituted region for latitude, the prevalence of celiac disease was higher in the Northeast (1.11%) and Midwest (0.94%) compared with the South (0.37%), and did not differ in the West (0.70%) vs the other regions. Participants’ unadjusted mean tTG IgA titer was higher at a latitude of 35° to 40° North (1.2±6.8 U/mL) or above 40° North (1.2±7.0 U/mL), compared with below 35° North (0.8±2.3 U/mL). What could be the cause of the North–South difference in celiac disease prevalence? Unalp-Arida et al say that exposure to sunlight or ultraviolet B radiation is generally lower in Northern latitudes and increases risk for vitamin D deficiency, which could contribute to the North−South gradient in autoimmune diseases. Susceptibility to latitude-dependent autoimmune diseases might involve expression or activity of the vitamin D receptor, which regulates gene expression in many cell types, including immune cells. The authors state that variations in hygiene standards, frequency of microbial infections, and early childhood feeding practices could lead to differences in development of the immune system in young children. Socioeconomic status can also influence health-seeking behavior and access to health care, increasing opportunities for diagnosis. However, this would not completely account for the association the authors observed among total celiac disease cases, most diagnosed based on serology results. The authors say that in India, celiac disease was found to be more prevalent in the North than the South and correlated with greater wheat intake, but not with genetic background. Unalp-Arida et al point out the limitations of using NHANES to study celiac disease, including their inability to confirm diagnoses by histologic analysis of small intestinal tissues. This study defined celiac disease based on a self-reported health care provider diagnosis and adherence to a gluten-free diet or on positive results from serologic assays. The authors state the the potential nutritional deficiencies associated with a gluten-free diet are of concern, especially because most persons following a gluten-free diet do not have a clinical diagnosis. Their population-based survey findings warrant additional, longitudinal studies.